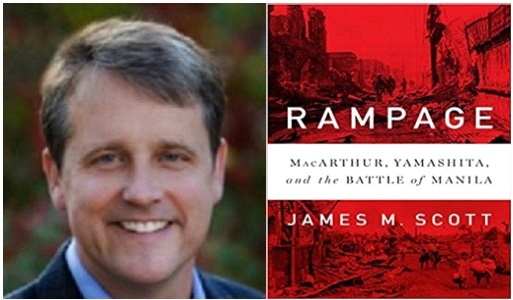 Join us at the museum for a lecture and book signing with author James M. Scott on Wednesday, October 10 at 7:00 p.m. Mr. Scott will be discussing his new book Rampage: MacArthur, Yamashita and the Battle of Manila which will be released October 2, 2018. Rampage based on extensive research in the United States and the Philippines, including war-crimes testimony, after-action reports, and survivor interviews, recounts one of the most heartbreaking chapters of Pacific war history. A former Nieman Fellow at Harvard, James M. Scott is the author of Target Tokyo, which was a 2016 Pulitzer Prize finalist and was named one of the best books of the year by Kirkus, The Christian Science Monitor and The Fort Worth Star-Telegram. His other works include The War Below and The Attack on the Liberty, which won the Rear Admiral Samuel Eliot Morison Award. His fourth book, Rampage, will be released on October 2, 2018.